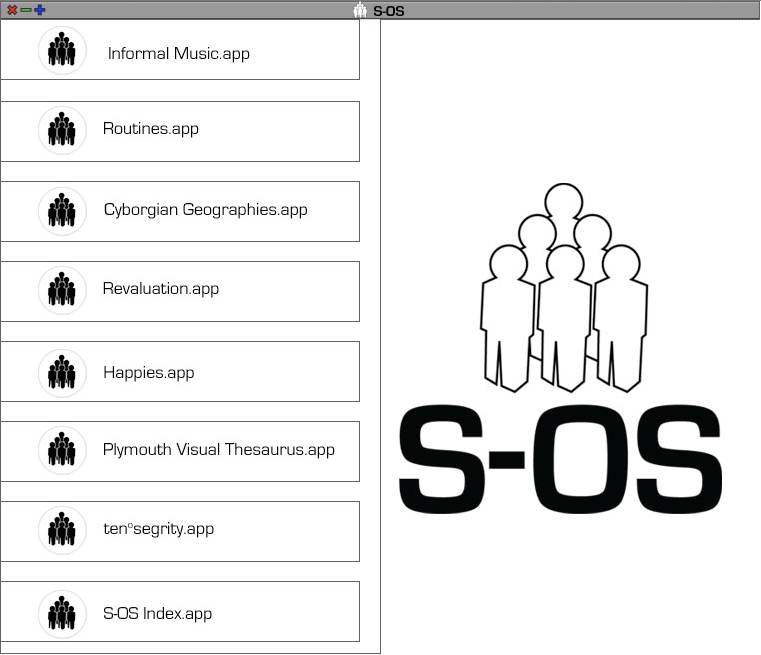 S-OS: Social Operating System for Plymouth. 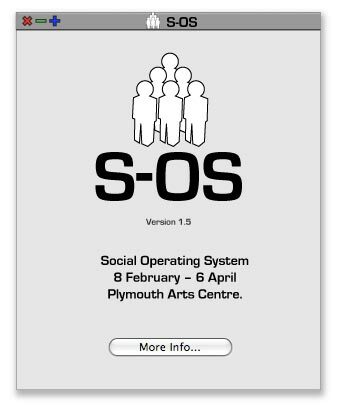 i-DAT, in collaboration with Plymouth Arts Centre, presents: ‘S-OS: a Social Operating System’ for the city of Plymouth. 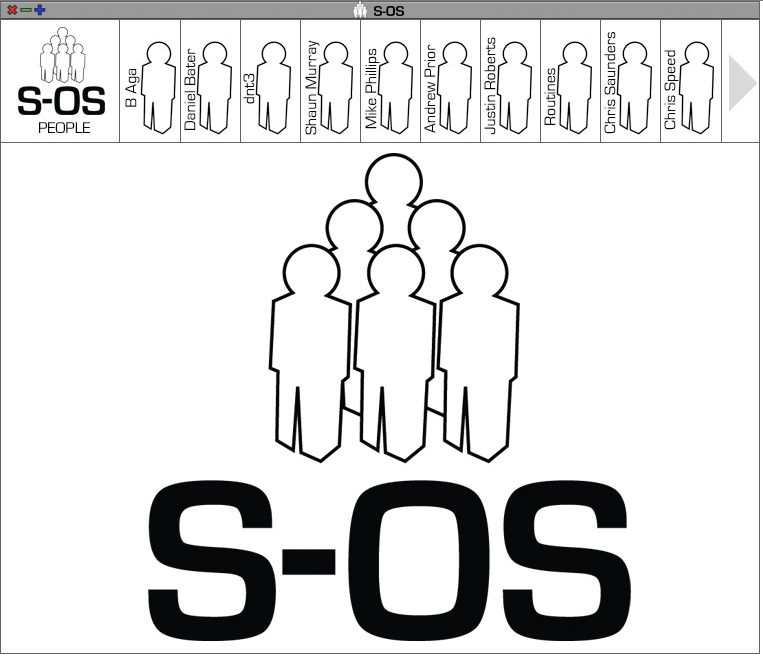 S-OS is a collection of creative interventions and strategic manifestations that provides a new and more meaningful ‘algorithm’ for modelling ‘Social Exchange’ and proposes a more effective ‘measure’ for ‘Quality of Life’. i-DAT, a Centre of Expertise at the University of Plymouth, is a catalyst for creative innovation across the fields of Art, Science and Technology, facilitating regional, national and international collaborations and cultural projects. As a networked organisation and ‘cultural broker’ i-DAT’s transdisciplinary agenda fosters ‘open innovation’, Knowledge exchange and reciprocal relationships between companies, institutions, communities and individuals. Plymouth Arts Centre and i-DAT present a series of new projects and residencies that have been developed through an ongoing collaboration that explores new systems and technologies for artistic production, dissemination and participation that challenge the traditional models of creation and consumption of art. 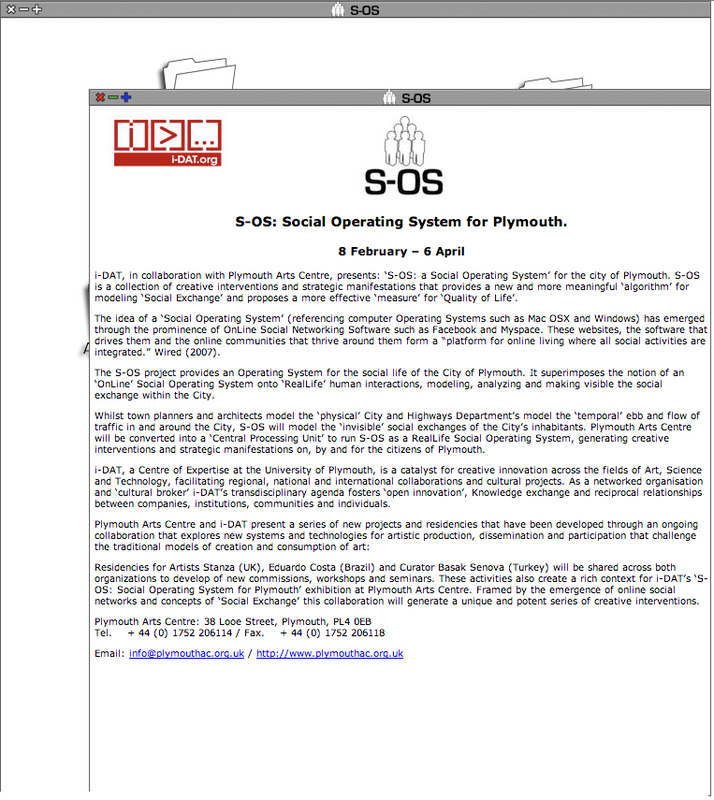 ‘Informal Music’ records and mixes the acoustic environment of the City of Plymouth. Presenting the noises and traces of human communications in and around city, Informal Music mixes field recordings of social exchange (conversations, songs, whistles and rants). The resulting signals provide an acoustic residue or echo of human interaction. 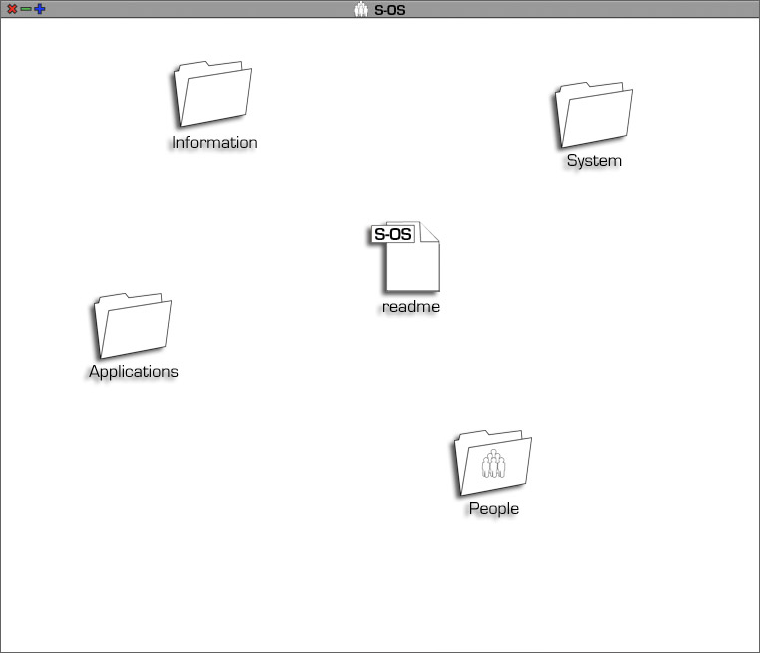 The processor can be modified through interaction with the S-OS: Index Application. No one really knows Plymouth – and you can bet that if you asked every one of the 240,000 residents to draw a map of their city, each map would be significantly different. Each one of us gets to know Plymouth from our own particular perspective. We construct ‘mental maps’ of the city from the routes that we take to and from familiar places, such as our favourite shops, the people that we like to visit and our place of work. A) GPS tracks recorded over a day and are replayed in real-time. Shaun Murray’s projects are harbingers for a meaningful ecological (both machinic and natural) audit of specific sites and the development of a series of tactics and protocols that can deliver to architects a full understanding of their sites and of the agents, provocateurs, cybernetic systems and disparate observers and drifters that influence and use them. Modern architecture has failed to provide architects with these now very necessary tools to create architectures that are fully in tune with the wide gamut of artificial and natural ecological conditions. For those of us interested in the architecture for the new cyberised, biomachined inhabitants of the twenty-first century Murray’s research and propositions are a beacon in a still dark landscape of the future. How happy are you? By measuring the little exchanges that take place daily you can calculate your personal ‘Happindex’. Personal Happindex’s can be collected, pooled with others and processed to measure Plymouth’s overall Happindex. The Plymouth Happindex can then be plotted to see how it performs against other more established indexes such as the FTSE, Nasdaq and Dow Jones. 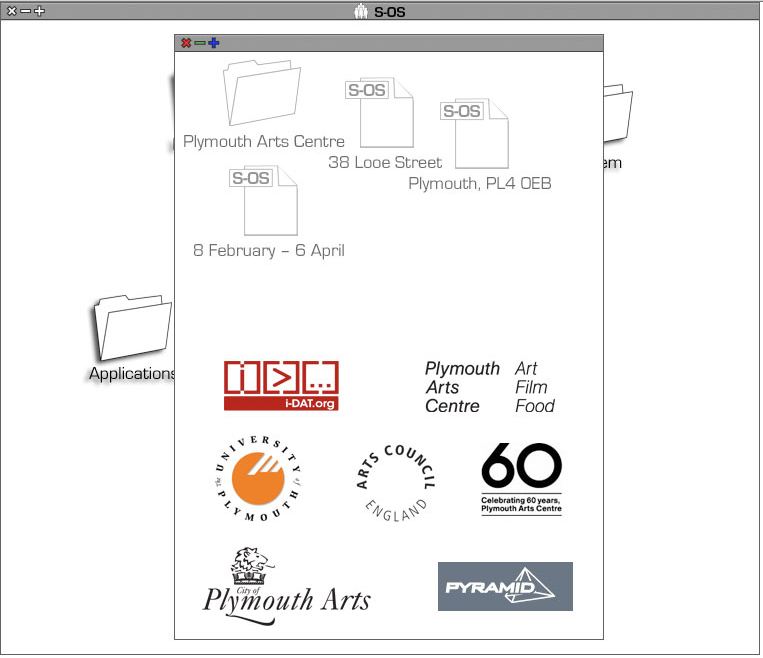 To generate your Happindex you will need to either download the Happies Application to your mobile by visiting www.s-os.org or visit the S-OS exhibition at Plymouth Arts Centre and transfer it to your phone using Bluetooth. Run the application and register the exchanges that happen to you. Your personal Happindex will be calculated. Select the upload feature and it will be added to help calculate the overall Happindex for Plymouth. You can also add new ‘exchanges’ to the Happies list. Plymouth dn[T]3 or Plymouth Visual Thesaurus is an interactive video installation for public spaces like galleries, squares or mall, indoor projection and ideal for huge outdoor projections, a collective digital graffiti. This project balances art, information design, linguistic psychology and social computing. Through a very simple interaction process the project means to show emerging knowledge pattern in the way we perceive our urban and social space and come out with new vision about collective way to organise knowledge on some current local and global issues. The project applies a folksonomies model, typical of Internet digital world to real world, but instead of describing and classifying digital goods people are asked to contribute to the creation of a meta-knowledge about real objects, everyday situations, emotions, concepts, everyday social life, etc. The aim is to build a semantic ecosystem, a memetic ecology of the city shown it’s social capital, through a collection of tags. The semantic e analyses words sent via SMS with an inferential engine – custom folksonomies engine – and tracks each word received as: absolute frequency, relations frequency. 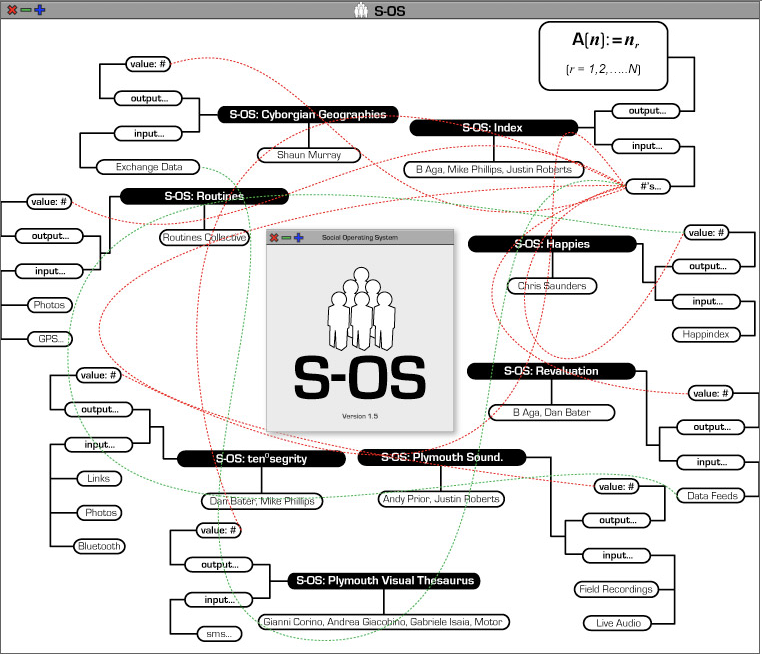 Interaction is free, in real-time and easy, people just need to send theirs free association words (tags) via SMS and immediately they become part of the project visual thesaurus. The SMS methodology of communication has been chosen because of the special relationship we have with the mobile phone and with words through it: sometimes intimate, symbolic, or emotionally involving. The word (tag in our case) flows from small to big, from private to public, from personal to collective. The tenosegrity Application allows visitors to the S-OS exhibition to submit camera phone portraits to the tenosegrity database via Bluetooth. Once submitted their portrait can be interconnected within the tenosegrity collective, each connection can be weighted using a simple star rating to indicate levels of familiarity and separation. Subsequent interaction with the application reveals the social tensions that bind a community through the dis/con-tinuous push/pull forces of tension and compression, or attraction and repulsion. The integrity of the tensions captured within the tenosegrity application provides a numerical value of social synergy and degrees of separation. tenosegrity outputs the value of the synergetic forces within these volatile social relationships. B Aga, Mike Phillips, Justin Roberts.